The food industry is one of the most competitive markets in the world, from small catering companies and deli shops to large scale supermarket chains and retail stores. More recently, as consumers we have become accustomed to a take-out culture with an emphasis on speed while retaining the same, expected high standard. Whilst large supermarkets are equipped to handle this, small deli shops and catering companies work usually work on a smaller scale, with smaller profit opportunities, and are usually confined to a localised area. It is therefore essential that every product sold of the same high standard and efficiently made to minimise waste. This blog post will show how businessess can save time and money by using an accurate food weighing scale, A&D's FS-i washdown checkweighing scale. 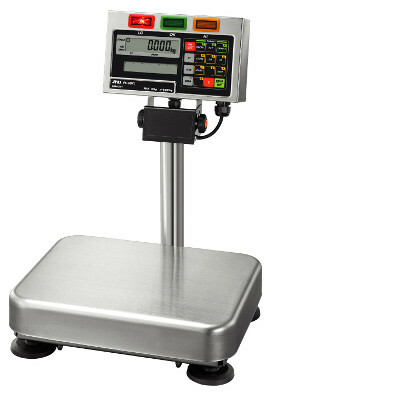 Food scales are essential pieces of weighing equipment for any small business and can be used to weigh ingredients and checkweigh finished products. For example, if I own a local deli business with a trademark sandwich range, I want to ensure that each sandwich tastes delicious everytime. By weighing the sandwich ingredients you are guaranteed to have the right balance of filling everytime as well as reduce waste product from estimated portion sizes, ultimately saving you money. Historically in England, bakeries were required by law to use standardised measurements for loaves of bread and other baked goods in accordance with the 1822 Bread Act, actively legislated until September 2008. Despite this, when selling food products commercially by weight, businesses are still required to use a certified trade approved food scale. To learn more, see our page on trade approved scales for the food industry. The FS-i waterproof checkweigher scale has been well accepted in the market because of its ultrafast response time of just 0.5 second, brightly coloured 3 comparator lights and waterproof IP-65 certified stainless steel construction. Following the initial success and in response to customer feedback we are now able to offer FS-i with improved functionality. Our newly added “Auto Tare” function, combined with “Negative Weighing”, make an ideal combination in a wide variety of applications, including many food and farming applications like pizza toppings or the weighing of “punnets” of strawberries, mushrooms etc. Another well known example is the “Sandwich Filling” application. Use 3 units of FS-i checkweighing scale in a line for a bunch of bacon, lettuce and tomato in each container. Take out some necessary portion out of each container, and you will see the green OK comparator light on and the negative value on the display is automatically tared to Zero for the next batch. Taking too much, or too little out of the container, red or yellow light is turned on for the indication of the error. This “filling” process is significantly faster at every step, greatly improving efficiency. If you require more information about how weighing scales can benefit your bakery or sandwich shop or for any questions regarding the FS-i checkweigher please contact us - We are also happy to offer further help choosing the best food scale for your business on request.